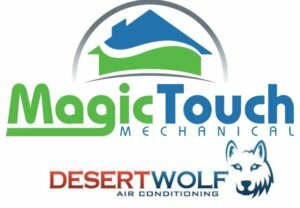 Desert Wolf Air Conditioning Joins Magic Touch Mechanical! Back in 2012 Aaron Woolf and his wife Deserea formed Desert Wolf Air Conditioning. Seven years later, Magic Touch Mechanical president, Rich Morgan met Aaron and the two immediately hit it off. “Desert Wolf’s high standards and customer service align with all the values that are important to my partner Michele and I”, said Rich. “I knew it was a good fit so I made them an offer I knew they couldn’t refuse!”, he added. Knowing long-time Desert Wolf Air Conditioning customers were in good hands was extremely important to them. “Many of our clients are friends or friends of friends. I wanted to be sure they were taken care of. 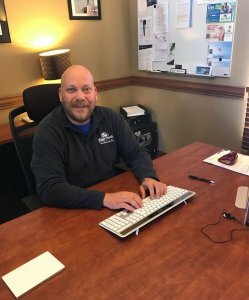 Magic Touch Mechanical has a reputation of treating their customers and employees well for over twenty-years. Customer satisfaction and ethical values are as important to Rich and his wife Michele as they are to Deserea and myself. It’s nice knowing our clients will get the same great service they got from Desert Wolf Air Conditioning with Magic Touch”, said Aaron. Desert Wolf Air Conditioning Customers Can Expect More! “I wanted Desert Wolf to be a part of something bigger” said Aaron. “Desert Wolf Air Conditioning wasn’t as large as Magic Touch is. I didn’t have the resources to get to our customers as quickly as they deserve. Now, they can get same-day or next-day service in most cases – which I’m so happy about”, he added. “I’ve always admired Magic Touch Mechanical from afar. In fact, I tried to emulate some of the ‘above-and-beyond’ services they offer that are unlike things other companies do. Now Desert Wolf Air customers will receive an even higher level of service. I’m looking forward to having more time with my family, thanks to the added resources”, he said. While Desert Wolf Air Conditioning only offered heating and cooling repair & installation, now their clients can expect more! Magic Touch Mechanical offers all of the HVAC services Desert Wolf Air Conditioning did, and then some! Aside from having more AC brands to choose from, including; Lennox, Trane, Bosch, Mitsubishi, York and more, we offer more services too. Magic Touch Mechanical is one of the largest Energy Efficiency Auditing companies in Arizona, approved by SRP, APS and Southwest Gas. We’re not just an “auditing company” either, we can fix the comfort, efficiency, and air quality issues in your home as well. Home comfort and efficiency repairs include; insulation & radiant barrier installation, duct leak testing & sealing, window shade screens (sun screens), and even home leak testing & sealing. Other services include; pool heater repair, fireplace & fire pit repair & upgrades, air cleaners & purifiers, and home automation. As the founder and president of Magic Touch Mechanical, I want to reassure Desert Wolf Air Conditioning customers what they can expect now. I won’t just hire anyone to join the Magic Touch family, and I wouldn’t acquire just any company’s clients. In fact, we hire about 1 in every 20 people that interview for a position at Magic Touch. Over the 22-years we’ve been in business, we’ve had the opportunity to acquire many air conditioning companies. We’ve acquired a few, and turned down 3-times as many. I thoroughly vetted Desert Wolf Air Conditioning and Aaron himself. What I found was a company history and an owner with a great reputation, high ethical standards, honesty, and top-notch service standards. These are the same values that are important to me and my team so it was a no brainer to welcome Desert Wolf Air Conditioning clients into the family. You can expect the same friendly and trustworthy service from every member of Magic Touch you are used to! Just faster! In fact, the only difference you can expect is 7-day service (at no additional fee), speaking to a live person when you call, and a broader service offering. We’ve had an A+ record with the Better Business Bureau since day one, and are a BBB Ethics Torch Award Winner. I welcome you to the Magic Touch family as well, and promise you’re in great hands from a team that truly cares!